If Prime Minister Modi’s vision of 100 gigawatt (GW) solar energy by 2022 comes true, its benefits would stretch beyond energy security and environmental paybacks. According to a new study, it could create a million green jobs in India, where large scale unemployment is one of the top socio-economic issues. Further, achieving India’s proposed target of 60 GW of wind energy by 2022 could also generate an additional 180,000 jobs. The number of jobs created in the green energy sector could actually be much higher as the study doesn’t include jobs created in the manufacturing sector. While under the new government, there is much emphasis on giant projects like solar farms, the analysis showed that they produce the least number of jobs among various types of solar projects. On the other hand, labour-intensive rooftop solar projects produce maximum number of jobs – both short-term and long-term. The study examined three scenarios and found if the 100GW solar target is achieved through the current mix of project types as proposed by MNRE – 40GW rooftops, 40GW of large-scale projects and 20GW solar parks – it will yield over 1,080,000 FTE. But, if solar rooftop is prioritized in India, then with a mix of 60GW rooftops and 40GW large-scale projects, the country would get the maximum benefit of 1,310,000 jobs. The report clearly recommends that rooftop solar systems be given priority. As for wind energy, India ranks fifth in the world. This sector can generate 183,500 jobs if 60GW of wind power capacity gets installed by 2022. According to the estimates, 59% of these jobs would be for semi-skilled workers while 21% would require unskilled workers; 81% of these would be one-time jobs such as construction while 19% would be permanent. In January, Prime Minister Modi and US President Barack Obama strengthened their clean energy cooperation during the US-India summit, creating joint programmes to scale up renewable energy and create jobs through transnational investment strategies. In December, Modi had raised the solar energy target from 20 GW to 100 GW of grid-connected solar energy by 2022. 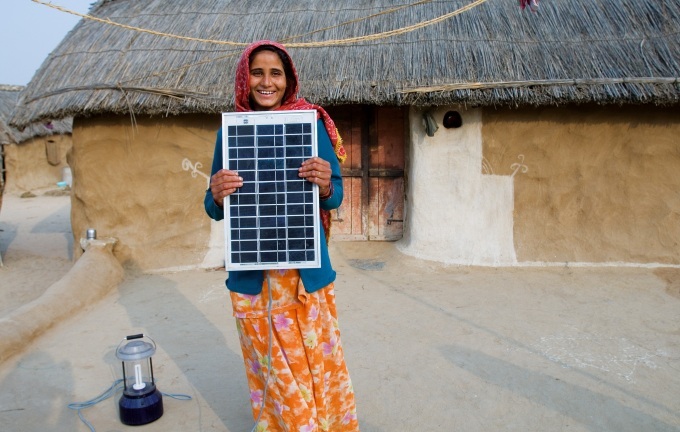 India’s solar and wind programmes have already catalysed remarkable growth. The study states that in just four years, India’s solar market has grown more than a hundredfold, exceeding 3GW of installed capacity. With 250GW of total installed energy currently and a need for much more power, scaling up solar and wind energy projects is a win-win strategy. As a result of this, despite limited data, the study estimates that grid-connected solar and wind energy development have created nearly 70,000 full-time jobs in India. At a time when the price of crude oil has gone down to $50 a barrel – more than half from the peak $107 last June – experts are hoping that the findings of the study will give the renewable sector a much-needed push. Shows the hope, but economic viability and its cost effectiveness along with desired minimum scale of operation will be worth seeing. However, i wish it opens immense number of jobs. Looking forward to development ahead.